Epson t1295 ink cartridges have been well-known because of providing outstanding print out for a long period of time. For getting the print outs of financial records and important documents they have demonstrated to be tremendously valuable and competent. The ink cartridges Epson t1295 are the life of any functioning printer. In case you have an Epson copier then make use of the Epson ink cartridges as they are compatible to them. Epson cartridges have quick-dry ink that does not blotch on the paper. What's the difference between T1291,T1292,T1293,T1294 and T1295? T1295: it composes by 4 cartridges, that is the collection of T1291,T1292,T1293,T1294. What's the difference between T1285 and T1295? 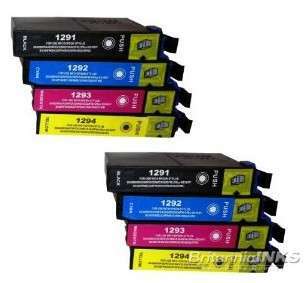 Epson T1281-4 and the T1291-4 cartridges do vary in ink fill levels. Epson consider the T1281-4's to be a 'Medium' sized cartridge and thus contain 5.9ml in the black and 3.5ml in each of the colours. The T1291-4's are deemed to be a 'large' cartridge and contain 11.2ml and 7.0ml respectively. Some of the new Epson printers will only accept the smaller cartridge notably the Stylus S22 and SX125, where as the SX420W, SX425W and Stylus Office BX305FW can accept both sizes - worth noting if considering a new Epson, so you aren't limited to just these tiny cartridges, unless of course you find a reputable retailer of compatibles! 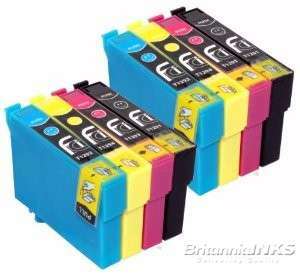 What are OEM (original) Epson T1295 cartridges? OEM (Original Equipment Manufacturer) Epson T1295 ink cartridges are manufactured by the maker of the printer. OEM products offer excellent quality, however at very high price which is not affordable to everyone. 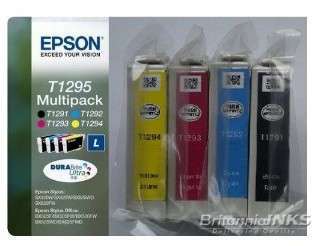 What are compatible Epson T1295 multipack ink cartridges? 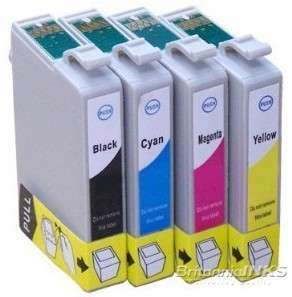 Compatible Epson T1295 ink cartridges are made by third parties as replacements to the originals. They are designed to work the same way as OEM cartridges. Our high quality compatible cartridges offer as good quality as OEM products at much lower price. Why buy compatible cartridges from https://www.britanniainks.co.uk? Our compatible Epsom T1295 ink cartridges come with the latest chip and work the same way as original. They are filled with highest quality ink (which is made in US) and gives best performance as originals. You will save 50% or more on the cost when using our compatible cartridges comparing with originals. Our Epson T1295 ink cartridges have up to 18 months shelf life and we offer no quibble 12 months warranty. Will compatible cartridges damage my printer? No. Our T1295 compatible ink have been tested thoroughly to make sure they will work flawlessly with all supported printer models. Also the cartridges are filled with highest quality ink which is made in the USA to give the best protection to print head. Will using compatible Epson T1295 ink cartridges void the printer manufacturer warranty? No. It is not allowed by law for the printer manufacturer to use warranty preventing customers using consumables from third parties.